Late in life, Michel Foucault developed a curious sympathy for neoliberalism. Since his death in 1984, Michel Foucault’s work has become a touchstone for the academic left worldwide. But in a provocative new book published in Belgium last month, a team of scholars led by sociologist Daniel Zamora raises probing questions about Foucault’s relationship with the neoliberal revolution that was just getting started in his last years. In an interview this month with the new French journal Ballast , Zamora discusses the book’s fascinating findings and what they mean for radical thought today. Below is the text of the interview, translated from French by Seth Ackerman. Of course! I’m fascinated by the personality and his work. To my mind it’s precious. I also enormously appreciated the work recently published by Geoffroy de Lagasnerie, La dernière leçon de Michel Foucault . Ultimately his book is sort of the flip side of ours, since he sees in Foucault a desire to use neoliberalism to reinvent the Left. Our perspective is that he uses it as more than just a tool: he adopts the neoliberal view to critique the Left. In your book, you contest his vision of social security1 and wealth redistribution. Could you talk about that? But going from one objective to the other completely transforms the conception of social justice. Combatting inequalities (and seeking to reduce absolute disparities) is very different from combating poverty (and seeking to offer a minimum to the most disadvantaged). Carrying out this little revolution required years of work delegitimizing social security and the institutions of the working class. In France this debate begins to appear in 1974, through Lionel Stoléru’s book Vaincre la pauvreté dans les pays riches ( Conquering Poverty In the Rich Countries ). It’s also interesting to note that Foucault himself met with Stoléru several times when Stoléru was a technical advisor on the staff of [right-wing French president] Valéry Giscard D’Estaing. An important argument runs through his work and directly attracted Foucault’s attention: in the spirit of Friedman, it draws a distinction between a policy that seeks equality (socialism) and a policy that simply aims to eliminate poverty without challenging disparities (liberalism). For Stoléru, I’m quoting, “doctrines. . . can lead us either to a policy aiming to eliminate poverty, or to a policy seeking to limit the gap between rich and poor.” That’s what he calls “the frontier between absolute poverty and relative poverty.” The first refers simply to an arbitrarily determined level (which the negative income tax addresses) and the other to overall disparities between individuals (which social security and the welfare state address). In the early phase of the industrial revolution, only property owners were full citizens, and as the sociologist Robert Castel emphasizes, it was only with social security that the “social rehabilitation of non-property-owners” really took place. It was social security that established, alongside private property, a social property, intended to usher the popular classes into citizenship. This is the idea Karl Polanyi advances in The Great Transformation , which sees in the principle of social protection the aim of withdrawing the individual out of the laws of the market and thus reconfiguring relations of power between capital and labor. If you look at the few critical intellectuals who contest Foucault (I’m thinking of Mandosio, Debray, Bricmont, Michéa, Monville, or Quiniou), you might say, in broad terms, that they criticize him for positioning himself as more “sociétal” than “social” [i.e., more socio-cultural than socio-economic]. But in focusing on “the marginal” (the excluded, the prisoners, the mad, the “abnormal,” the sexual minorities, etc. ), didn’t Foucault make it possible to bring into the light all these people who had until then been ignored by orthodox Marxism — which had only been able to see economic relations? You’re absolutely right. I’ll say it again: his contribution on this point is very important. He clearly removed from the shadows a whole spectrum of oppressions that had been invisible before. But his approach did not solely aim to put these problems forward: he sought to give them a political centrality that can be questioned. To say it plainly: in his eyes, and in the eyes of many writers of that period, the working class today is “embourgeoisée,” it is perfectly integrated into the system. The “privileges” that it obtained after the war make it no longer an agent of social change, but, on the contrary, a brake on the Revolution. This idea was very widespread at the time, it can be found in authors as varied as Herbert Marcuse or André Gorz. Gorz would go so far as to speak of a “privileged minority,” with respect to the working class. The end of this centrality — which was also a synonym for the end of the centrality of work — would find its outlet in the “struggles against marginalization” of ethnic or social minorities. The lumpenproletariat (or the “new plebeians,” to use Foucault’s term) acquired a new popularity and was now seen as a genuinely revolutionary subject. The problem of exploitation and wealth had been replaced by that of “too much power,” the power of control over personal conduct, and forms of modern pastoral power. At the dawn of the 1980s, it seems clear that for Foucault it was no longer a question of redistributing wealth. He has no trouble writing: “One could say we need an economics that deals not with production and distribution but an economics that deals with relations of power.” Thus, it’s less about a struggle against power “as economic exploiter,” and more about struggles against day-to-day power, embodied especially by feminism, student movements, prisoners’ struggles, or those of the undocumented. Let me be clear, the problem is obviously not to have placed on the agenda a whole spectrum of dominations that had once been ignored, the problem comes from the fact that these dominations are more and more theorized and thought outside of questions of exploitation. Far from outlining a theoretical perspective that thinks through the relations between these problems, they are little by little pitted against each other, even thought of as contradictory. That’s essentially what some people criticize him for: praising the figure of the “delinquent,” the criminal, and the lumpen while ridiculing the “conservative” laborer and worker. In your book, Jean-Loup Amselle draws a link between this abandonment of “the people” and the “écolo-bobo” position of the governmental left, along the lines of Terra Nova [a neoliberal French think tank close to the Socialist Party]. What do you think of that? The problem is that this dismissal of the working class had rather astonishing effects. It put at the forefront of public debate the “social exclusion” of the unemployed, immigrants, and the youth of the banlieues as the principal political problem. This evolution ended up being the point of departure — on both the Right and the Left — for the centrality “the excluded” were to assume, the idea that now “post-industrial” society would divide between those who have access to the labor market and those who, to one degree or another, are excluded from it — thus displacing the focus from the world of work to exclusion, poverty, or unemployment. Obviously the political content of these right-wing statements differs radically from those of these late 1970s authors, but they both presuppose that today it is “the excluded” who pose the problem, or the solution; it is the surplus population that has become the central political subject and no longer the working class. Indeed, how can we not see a strange paradox between Gorz’s “non-class” and the “underclass” that is so dear to the ultra-conservative ideologue Charles Murray? Both for Gorz and for the neoliberal movement, it is no longer the fact of being exploited that poses the problem, so much as one’s relationship to work. Gorz sees the way of life of the surplus population as a “deliverance” from work, and Thatcher sees a “vice” of laziness that must be combated. One elevates a “right to be lazy” to the status of virtue, whereas the other makes it out as an injustice that must be destroyed. But underneath, these two versions function in the same logic. Thus, both the Left and the Right want the “surplus population” to be the problem, thereby supplanting those old, out-of-date, dogmatic ideas that placed exploitation at the heart of the social critique. Debray writes in Modernes catacombes that Foucault, the rebel and subversive, has become an “official philosopher.” How do you understand this paradox? And how do you explain how Foucault can seduce so many of those in radical milieus who nevertheless affirm with force that they wish to put an end to the neoliberal era? It’s a very interesting question, but one I don’t have a satisfying answer to. I would, nevertheless, suggest that it’s in large part due to the structure of the academic field itself. You’d have to go back to Bourdieu and the precious works of Louis Pinto to better understand this evolution. It should never be forgotten that joining a “school,” or associating oneself with a certain theoretical perspective, means associating oneself to an intellectual field, where there is an important struggle for access to the dominant positions. Ultimately, calling oneself a Marxist in the France of the 1960s — when the academic field was in part dominated by self-identified Marxists — did not have the same meaning as it does to be a Marxist today. Concepts and canonical authors are obviously intellectual instruments, but they also correspond to various strategies for becoming part of the field and the struggles over it. Intellectual developments are then partly determined by relations of power within the field itself. Also, it seems to me that relations of power within the academic field have changed considerably since the end of the 1970s: after the decline of Marxism, Foucault occupied a central place. In reality, he offers a comfortable position that allows a certain degree of subversion to be introduced without detracting from the codes of the academy. 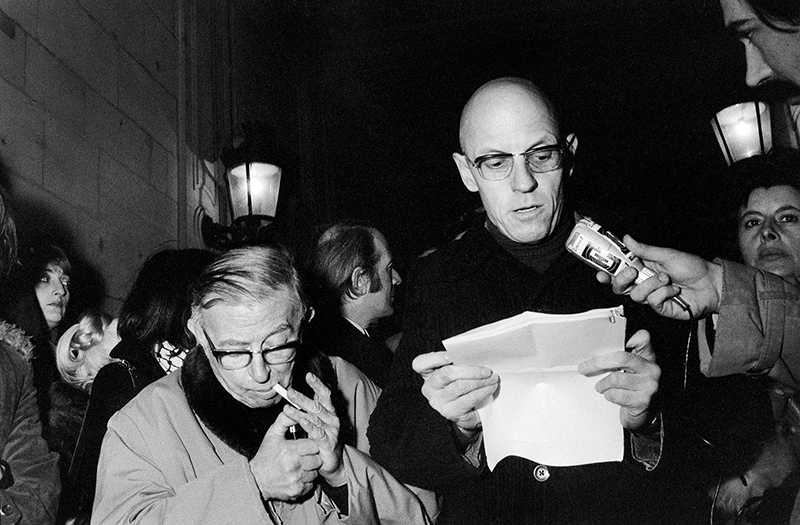 Mobilizing Foucault is relatively valued, it often allows his defenders to get published in prestigious journals, to join wide intellectual networks, to publish books, etc. Very wide swaths of the intellectual world refer to Foucault in their work and have him saying everything and its opposite. You can be an adviser to the MEDEF and edit his lectures! [A reference to François Ewald, adviser to the main French business federation; see above.] I would say that he opens doors. And you can’t really say the same of Marx nowadays. This critique of the “margins” as the center of political combat could end up delighting all manner of counter-revolutionaries in France or Belgium. Aren’t you afraid of playing into their hands? As for the idea of “playing into their hands,” I don’t think it’s a problem. If there’s a problem with certain aspects of the legacy of May ’68, the role of the Left is not to close its eyes because the far right is saying it, but on the contrary, to render its own judgment, to formulate its own critique, so as not to totally lose the ideological battle. That is the task we need to get started on in order to reconstruct a left that is both radical and popular. 1. “Social security” is used here in its French meaning, to refer to all social insurance. For example, France’s national health insurance is part of its “social security” system.